The large rocks begin their journey south of the Bellingham Shipping Terminal. Cranes load them onto barges before they leave on their journey. Photo courtesy: The Port of Bellingham. A jetty at the mouth of the Columbia River was badly damaged after being pummeled by 30-foot Pacific Ocean waves this winter. Now Bellingham is coming to the rescue. 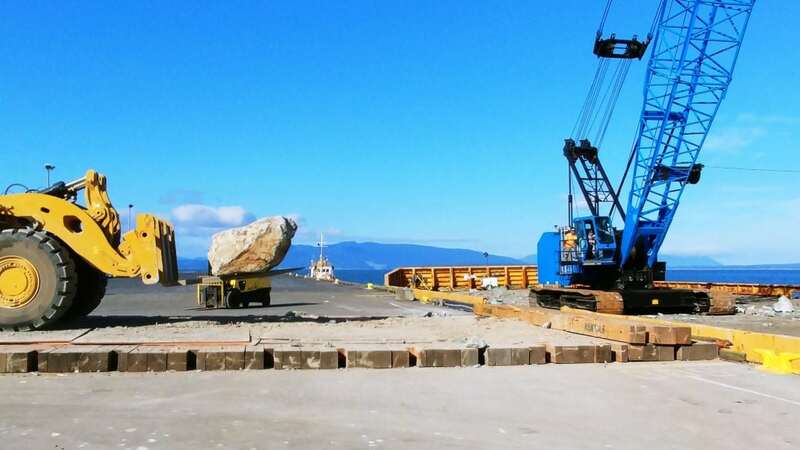 Huge rocks are being plucked from Bellingham’s coastline and shipped south to be added to the structure. The Columbia River is the largest river on the Pacific Coast of the United States. Between 1885 and 1839, crews constructed a jetty system to keep the mouth of the river safe for travelers and commercial shipping operations. The Columbia River jetty system consists of three large rubble mounds, together totaling more than nine miles in length. The jetties make the sometimes treacherous channel safer for ships traveling between the Pacific Ocean and Columbia River while minimizing navigation channel maintenance and protecting the coastline. According to the Merchant’s Exchange of Portland, the ships at the mouth of the Columbia River are typically carrying grain, automobiles, petroleum, logs or shipping containers. Vessels arrive from all over the world to bring valuable goods to and from the United States. Without the jetty system, it would be impossible for cargo vessels to travel in and out of the river. The jetties are crucial for the continued flow of billions of dollars’ worth of commerce that moves through the Columbia River each year. Towering waves and intense winter storms are common in this estuary, often damaging the jetties. If a critical section of the jetties is severely damaged during a storm, built-up sand could spill into the navigation channel and shut down commercial shipping. Not only does the Columbia River jetty system benefit our state’s economy, it saves lives and ensures public safety. The Pacific Northwest Waterways Association says the US Coast Guard Station Cape Disappointment launched 162 search and rescue missions in 2015, saving nearly 100 lives around the jetties. Without the system, more rescues would be inevitable as they minimize the famously dangerous conditions at the mouth. Because one of the jetties is currently worn, its timely restoration is crucial. The U.S. Army Corps of Engineers is stepping in to help. Crews are finding SUV-sized boulders at local quarries in Bellingham and bringing them to the Bellingham Shipping Terminal on Cornwall Avenue near Bellingham’s waterfront. You can see the boulders piled up near the facility, but they won’t be there for long. The 60,000 pound stones are being hauled onto barges and sent south along the rocky Washington coast to Fort Stevens State Park at the mouth of the Columbia River. After some maneuvering, the rocks will find a new home in the jetty system. More than four thousand of them are needed to bulk up the jetty for several more decades of use. Mike Hogan, a spokesman for the Port of Bellingham, said the Port is only indirectly involved as some of the rocks are being sourced from local quarries. A Chico, California-based marine contractor, J.E. McAmis, is largely behind the project led by the U.S. Army Corps of Engineers (USACE). Jeff Henon from USACE tells the Chinook Observer that once the large rocks arrive at Fort Stevens State Park, crews load them onto tractor trailers by crane. The rocks are so big, Henon says, crew members often make more than 40 trips a day to move the cargo from the barge to Cape Disappointment where another crane crew waits to offload them. To ensure strength, durability and functionality, each rock must undergo a quality inspection. Crews use spray-paint to mark rocks that pass the test and a crane operator then moves them to the work area. Now, they’re ready for business. A custom-toothed excavator helps workers place the stones on the jetty, their final resting place. There, they will help protect the inlet from unpredictable weather, creating a safer waterway. Mike Hogan says the project is expected to last throughout summer 2018 and possibly 2019, too. “The idea with this is that hopefully we don’t have to go back there for another 50 years,” says Jeff Henon. That means Bellingham may be a part of the Columbia River jetty system for decades, if not centuries, to come. The jetty currently being repaired, the North Jetty, is the second in a round of an entire rehabilitation of this system. Crews completed repairs on the first jetty in 2017 and repairs for the South Jetty are slated for 2019, expected to require multiple years of work.